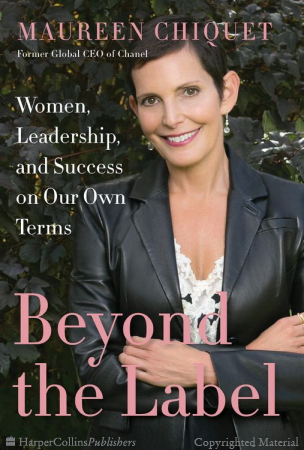 I am counting down until I receive my copy of Maureen Chiquet’s new business memoir called “Beyond the Label: Women, Leadership, and Success on Our Own Terms” (HarperCollins) which is officially releasing tomorrow. My husband brought her story to my attention a couple of weeks ago, as he was impressed after reading about her in his Yale newsletter (she is Yale ’85 and was just appointed to the Board there). Truthfully it was a superficial angle that I glommed onto — as some of you know, I’m going through breast cancer treatment & recently lost all my hair from chemo, but luckily now it’s growing out - I’ve got about 3/4” so far! :) To see such a strong, accomplished, stylish woman as Maureen Chiquet rocking the super short hair was great inspiration for me! BUT of course the real thing here is Maureen’s message itself — how to define what success means to YOU. She was CEO of Chanel for many years and before that held senior posts at the Gap/Banana Republic. She knows the luxury market, the mass market, and especially how to create powerful brands for women. Click here to watch her “Top 5 Business Rules.” I found it and her approach fascinating! There was also a great piece about her in yesterday’s New York Times & in reading so much about her, I find her question-asking, authentic style to be spot on with the way I approach my own brand consulting work with clients (you can see some examples here) It is so, so important in brand building to keep a kind of fresh, uncluttered view of the product or service - try to see it the way an outsider would. What does your brand ‘say'? How does it feel? Don’t assume people will like & get it right away. Make it easy for them to understand. Stay true to the product or service’s REAL core value — simplify, simplify so that the brand essence shines through! This ethos of course extends beyond the boardroom. I hate it when people call themselves “brands” but it is true that every individual has a distinct personality and reputation. How can we hone our own edge, so that we focus on and cultivate the kinds of values and achievements that matter most to US?? How can we stay true to our own unique definition of success and tune out other people’s versions?? It’s a constant process of refinement and discipline, but I think Maureen Chiquet’s voice and her inspiring book gives us all another great tool to keep at it. What books or mentors do you look to for inspiration and guidance? Please email me Lee@ElegantMayhem.com — I’d love to know your sources of inspiration & can share that out with all the readers in an upcoming post!